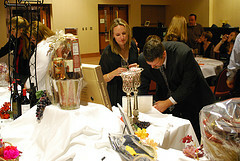 As you plan your silent auction event, keep looking for opportunities to maximize your event revenue. Remember, you’re spending lots of time planning this event, and probably spending at least some money to get it off the ground as well. You may as well maximize the return on your investment. Every extra dollar you raise is an extra dollar you can spend furthering your non-profit’s mission. If your organization is able to garner one or more impressive auction donations (large, expensive baskets, jewelry, vacations, etc. ), you might want to consider offering pre-auction bidding on one or more of the items. Pre-auction bidding means publicizing these auction items prior to the event and allowing people from your non-profit donor network to bid on these items prior to the actual event, either through an online software package designed specifically for this type of bidding, or simply by e-mailing your development staff with their bids. Your staff then writes the top pre-auction bid onto the bidsheet for that item, and that is where bidding starts at the event. If no event guest bids higher than the pre-bid, the person who made the pre-bid wins the auction. Don’t use this type of pre-auction unless you are having a large auction event and have received some significant items to allow pre-bidding on. If you only have 10 or so items in your auction and you offer pre-bidding, you may find that the bids get so high prior to the event that no one bids at the actual event. Guests would then likely get bored and may decide to skip next year’s auction. Likewise, if you are offering a bunch of $10 gift cards for pre-bid, it is unlikely to generate much interest, and there’s only so much people are willing to bid for such a small item. Offer VIP access to individuals or companies who sponsor your event (more on event sponsorships below). Offer VIP auction preview tickets for an additional charge of $10, $50, or $100 above your general admission silent auction ticket fees (amount of additional charge would depend on how much general admission costs). Offer VIP auction preview tickets to anyone who sells a certain number of tickets to the auction event. Offer VIP auction preview tickets to anyone who donates an item for the silent auction. Be creative! There are an almost unlimited number of ways you can generate revenue by holding a preview event. Remember, though, not to offer preview tickets to everyone (choose just a few of the ideas listed above) so that access to your VIP party stays “special” and exclusive.